Corin Hardy, director of The Nun, said that there hasn’t been a good gothic horror film in years, but I can’t believe that he truly felt that The Nun was going to blow minds and cause a resurgence in the genre. Why? 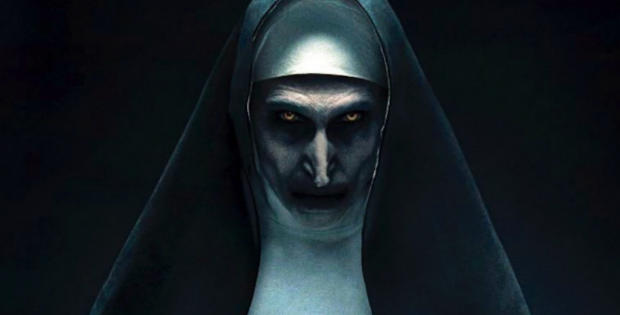 Well, mainly because The Nun is a horror dud that lacks any inkling of originality and focuses entirely on jump scares over the course 96-minute runtime – though even referring to what happens on screen as a jump scare would be an injustice to all the true, actual jump scares that have happened over the years. The Nun is the fifth film in The Conjuring universe that began with James Wan’s The Conjuring back in 2013. That movie was based on real life paranormal investigators Ed and Lorraine Warren (played by Patrick Wilson and Vera Farmiga) and actual events that they’ve lived through and investigated. During the movie we’re taken into a room that they store various items taken from their cases, including a possessed doll named Annabelle. Now, in the movie it’s just a creepy doll, but it was creepy enough that it spawned two movies in Annabelle (2014) and Annabelle Creation (2017), with a direct sequel to The Conjuring aptly called The Conjuring 2 being released in between them in 2016. Now, The Conjuring and The Conjuring 2 were great demonic possession horror flicks, with the first film surpassing them all. Outside of that, it gets a bit sketchy. Now, I do believe that a Conjuring universe could work if all of the films were as strong as the first, but that’s just not how this universe was handled. See, I’m not a hater of jump scares, as both Conjuring films have their fair share; however, the stories are a lot stronger, the acting is engaging, and you’re invested in things so much that you don’t always see them coming. That’s how a great jump scare is supposed to work. Yet with movies like The Nun, it feels like they’re just pumping out any by the numbers script just so they can get it into theaters as fast as possible and make big box-office. Now you may say, “Well, isn’t that the smart move if people will go see your movie anyway?” Sure, there’s some onus on the audiences, but sometimes you just want to get scared and you think, “Hey, it’s from the people who did The Conjuring and that was great, so maybe this will be too!” or it’s simply targeted at younger teen audiences out to enjoy a night of scares that doesn’t require parental guidance. But you see, those same people would go if you took the time to craft a well-told horror tale, and instead of it being dismissed after a single viewing, maybe it’d actually resonate and be something you look forward to seeing again and telling your friends about. But that’s not how The Nun was handled, as writer Gary Dauberman (who also wrote Annabelle and Annabelle Creation) goes through the usual horror tropes with the script, and Hardy directs the film in a way where the scares are just ridiculous and nonsensical. For example, a large majority of the “scares” in the film come from the audience seeing the Nun figure in the background as a shadow when the camera pans by, only to have the camera swing back and *gasp* the shadowy figure is gone. Spooky. This feels like it happens every few minutes to the point where you start to lose what little interest there may have been in the story and characters. In an interview on the special features, Hardy calls the Nun an iconic character, which baffles me because a few brief appearance in The Conjuring 2, no matter how creepy, doesn’t just make her a horror icon. That’s not to say that there wasn’t potential for her to get up there, as she’s an incredibly disturbing looking figure with a naturally eerie presence; however, unless they revamp her entirely, any chance at being taken seriously as even a generic horror monster has gone out the window with how she’s handled in this movie. There are a few brief moments where you can see the potential that a Nun prequel could have had, but the time and effort just wasn’t given to the story so we just got the basics that feel like a cash-grab. As the movie progresses the audience should be invested and on the edge of their seat, unsure of what’s to come, but instead the movie jumps into the final act in almost comedic fashion, complete with Ash-lite showing up with his boomstick and witty one-liners. It’s like the story fully derailed and they needed a way to loosely tie the film to The Conjuring 2 so that they’re all connected, regardless of how forced it is. And speaking of connections, Taissa Farmiga (younger sister of Conjuring star Vera) is the star of the film, yet her character, Sister Irene comes off as having zero relation to Vera’s Lorraine Warren at all. Theories that they’re the same person (as the film takes place some 20 years prior to The Conjuring) are easily dismissed with how the timeline is put together, and any relation is never spoken of in future films, so why even bother casting Taissa in the first place? This is nothing against her, as she does a solid job with what she’s given, but it’s just unnecessarily confusing to audiences to take the franchises most recognizable character and cast her almost identical younger sister as the lead in a prequel, give her the same power of having visions, and yet make zero connection to the two in this universe. I’d love to see Taissa in future horror films, but there’s just no reason to cast her here without giving some brief payoff in the form of a hint of a possible connection at some point – and even then it’d make no sense since none of this was ever mentioned in future films. The Nun was without a doubt a missed opportunity. The character itself had the potential to be incredibly creepy, and you could build off of it being an incredible evil without having to resort to every ridiculous thing that happens being explained because “a great evil presence inhabits this land;” but if a fun and scary movie to keep you entertained for 90-minutes is what you’re after, you’ll find nun of that here. The film transfer looks pretty good, with most scenes taking place at night, or within scarcely lit hallways or rooms. The scenes never look muddy, with the blacks being rich and the visuals doing their job in setting the mood that the script never does. The audio comes through well, with the usual eerie score pounding out when required. It sounds fine and never battles with the dialogue, but it’s all as predictable as the story so it’s hard to ever appreciate it. A New Horror Icon – This feature goes in to talking about the character of the Nun and hyping her up in ways that she’s not yet earned. Just because she had a few spooky scenes in The Conjuring 2 doesn’t put her up there with Mike Myers and Jason. Gruesome Planet – This is a featurette narrated by Hardy, who talks poetically about the shooting of the film. I found it hard to listen to him go on like that, though if you’re interested in the locations you may want to give it a watch. The Conjuring Chronology – This featurette lays out the order of the franchise so far, with Wan, Hardy and various other cast and crew talking about what it’s like working on the film and building upon the universe. Deleted Scenes – There are a lot of deleted scenes here for those who like to watch them. Warner Bros. Home Entertainment Presents The Nun. Directed by: Corin Hardy. Written by: Gary Dauberman. Starring: Taissa Farmiga, Demián Bichir, Jonas Bloquet, Bonnie Aarons. Running time: 96 Minutes. Rating: 14A. Released on Blu-ray: Dec. 4, 2018.